HCM CITY — HCM City’s Từ Dũ Hospital on Wednesday opened a Human Milk Bank, the second in Việt Nam. 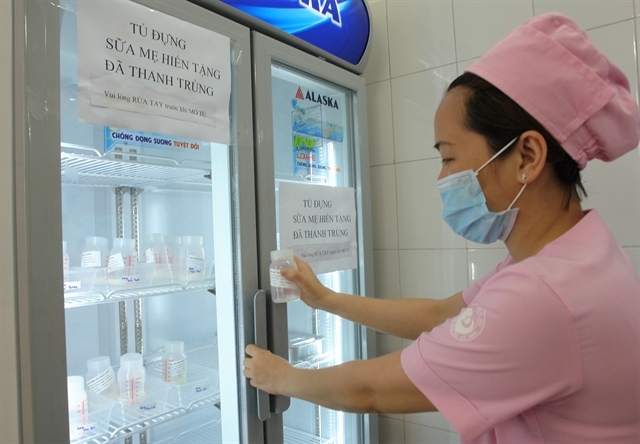 The science and technology council of the HCM City's Department of Health on April 4 officially recognised the milk bank, operated by the hospital’s neonatology department. The council said that donated breast milk at the bank was pasteurised under domestic and international standards. During the pilot period of operation, the results of tests of the first 20,280 litres of milk showed that microbiological standards had been met. Donated milk was used by 12 premature babies with the weight of 750 grammes to 1,700 grammes for three to six days. The babies could not be breastfed and had to be treated at the neonatology department because one of the mothers had died and four others had to return to their hometowns located far from the city. The remaining mothers did not have enough breast milk. A non-profit human milk bank at the hospital is vital, he said. Healthy mothers who have more than enough breast milk can volunteer to donate their milk to the bank. The hospital will set up an appointment for screening and testing before the donation. After testing, the breast milk will be collected and transported to the bank for pasteurisation and storage. The bank at Từ Dũ Hospital was set up by Alive & Thrive, a global nutrition initiative that saves lives, prevents illness, and ensures the healthy growth of mothers and children, and Irish Aid, Ireland's programme of assistance to developing countries. Breastfeeding fosters strength, a healthy metabolism, good digestion, a robust immune system, and brain development, he said. “Unfortunately, some infants do not have access to their own mother’s milk, often due to maternal illness, a delay in milk production, abandonment or death,” he added. Deputy Minister of Health Nguyễn Việt Tiến has told Hùng Vương Obstetrics Hospital in HCM City to set up a human milk bank to help premature babies at their facility. The deputy head of the city’s Department of Health, Tăng Chí Thượng, said the Từ Dũ Hospital milk bank would help reduce the number of premature babies with necrotising enterocolitis disease in which the gastrointestinal tract results in inflammation and bacterial invasion of the bowel wall. The bank at Từ Dũ Hospital will also provide breast milk to babies being treated at Hùng Vương Hospital and three paediatrics hospitals, he added.